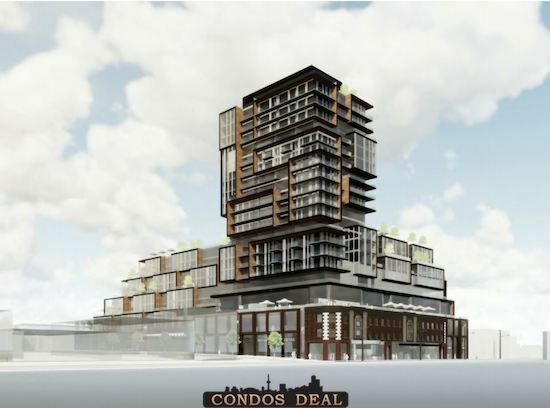 2500 Yonge Street Condos is a new condo project by Madison Group and is currently in pre-construction. 2500 Yonge architect is designed by Turner Fleischer Architects, GBCA Architects and Hariri Pontarini Architects. The new project will be located at 2500 Yonge Street in Toronto. The major intersection is Yonge Street & Eglinton Avenue East. 2500 Yonge Street Condos will be 21 storey tower with 377 mixed units. Units will be a mix of 66 one bedroom, 44 one bedroom plus den, 94 two bedroom, 135 two bedroom plus den, 32 three bedroom and 6 three bedroom plus den. The estimated completion date for 2500 Yonge Street Condos is still unknown. 2500 Yonge Condos will feature retail space on the ground level fronting Yonge Street. The site will also include a new 6,479 sqft public park at the northwest corner along Duplex Avenue. The building will have over 8,000 sqft of indoor amenity space and 15,600 sqft of outdoor space. On the second floor will have about 12,130 sqft of outdoor terrace space on the north side of the building connecting with a pair of 3,681 sqft and 3,638 sqft of indoor amenity space. An additional 914 sqft of indoor amenity space on the fourth floor connecting with 3,552 sqft of outdoor terrace space. The building will have a four level underground parking garage which will contain a total of 323 parking space. In the underground garage and at grade will also include a total of 426 bicycles space. Other projects by Madison Group are like NuTowns, 114 Church Street Condos, 50 Eglinton Avenue West Condos, Nobu Residences, REAL Towns, Briar Hill City Towns, 90 Eglinton Avenue West Condos and Zigg Condos.